Richard Kiel, Actor Who Played Jaws In Bond Films, Dies At 74 : The Two-Way Kiel delighted moviegoers with his quiet menace and his metal teeth in the role of Jaws, the Bond villain henchman who not only survived his encounters with 007, but also lived happily ever after. 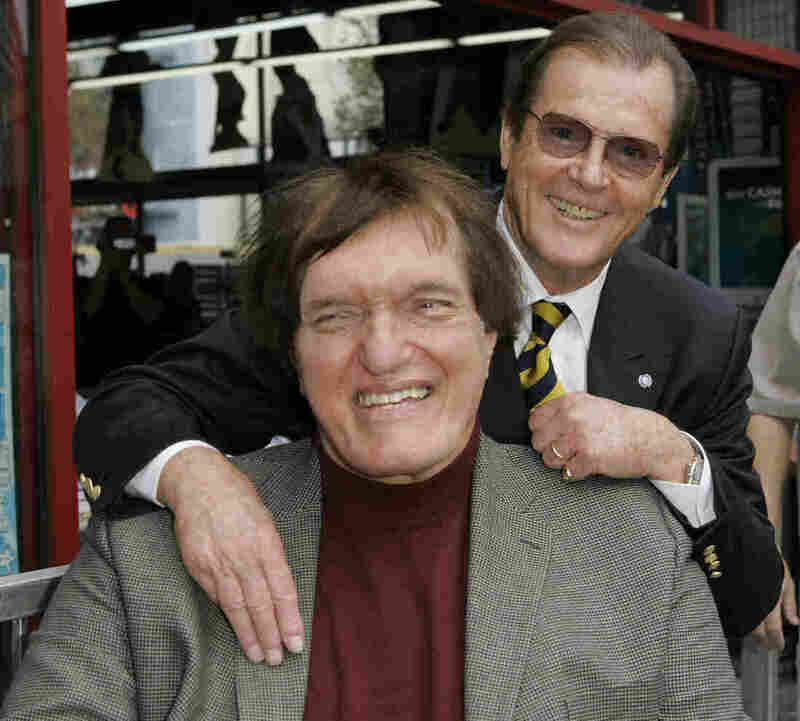 Richard Kiel (front) and Roger Moore at a ceremony in 2007 to honor Moore with a star on the Hollywood Walk of Fame. Kiel, who played Jaws in two Bond films opposite Moore, died Wednesday. He was 74. You might not know the name Richard Kiel, the actor who died Wednesday at the age of 74. But Kiel delighted moviegoers with his quiet menace and his metal teeth in the role of Jaws, the Bond villain henchman who not only survived his encounters with 007 but also lived happily ever after. Kiel played Jaws in two Bond films — The Spy Who Loved Me and Moonraker, both starring Roger Moore. "His name is Jaws," Bond tells Dr. Holly Goodhead in Moonraker. "He kills people." Jaws, all 7 feet 2 inches of him, was supposed to die at the end of The Spy Who Loved Me, eaten by a shark in villain Karl Stromberg's underwater lair. But the test audiences liked him so much that Jaws lived. He returned in Moonraker, where he was a henchman to Hugo Drax and survived crash-landing to Earth with his girlfriend, Dolly. The Associated Press adds that despite appearing in other films and TV shows, Kiel could never escape his iconic role. "To this day, I go out in sunglasses and a hat because people will shout 'Hey, Jaws!' at me from across the street," he told the Daily Mail in an interview. "The only way I can explain it is that he's like the Road Runner, which Coyote keeps trying to blow up, but he keeps going." "Kiel's other memorable roles included bullying golf spectator Mr. Larson in Happy Gilmore, lethal Dr. Loveless's assistant Voltaire in The Wild, Wild West and extraterrestrial Kanamit in The Twilight Zone. He also reprised the character of Jaws for several James Bond video games and voiced the thug Vlad in the animated Disney film Tangled. "Born in Detroit, Kiel began appearing in TV shows and films in the 1960s, debuting in an episode of the Western series Laramie. He published an autobiography in 2002 titled Making It Big in the Movies." In a statement, Moore said he was "totally distraught" at the news. We'll leave you with a montage of sequences featuring Kiel in the Bond movies.